Risk-reward ratios are on our radar screen these days as we review the most recent economic data against the backdrop of recent market movement. 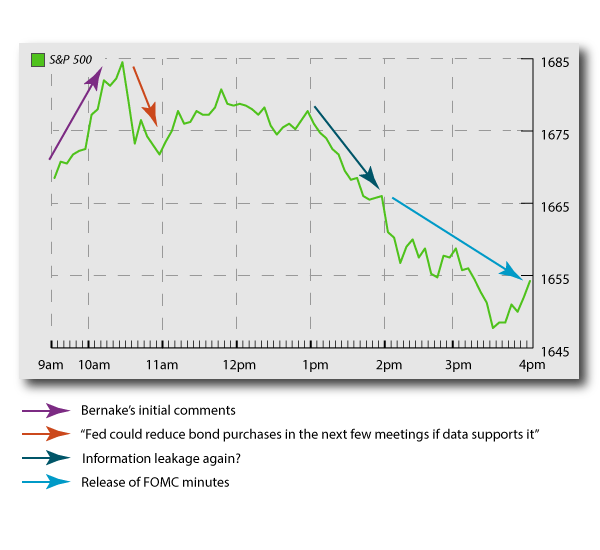 This is not to say that we are in any way suggesting a top, a bear market, or even that a correction is on the horizon, even taking into account this past week’s movement and volatility—although each of these scenarios remains a possibility. At this point, though, we do have some minor concerns about risk-reward in the markets going forward, suggesting that a slight adjustment in beta or equity exposure from current levels is prudent. Our investment philosophy is to adjust equity exposure based on the velocity of economic fundamental data, combined with analysis of correlations between assets. Our objective is to adjust asset exposures to create the most efficient portfolio. To be clear economic data is still positive, but the rate of increase in the positive data has not been accelerating with the market—and in some segments is slowing. For example the three-month trend of employment growth as measured by the jobs report has gone from 208,000/month at yearend, to 209,000/month as of April, which includes a large outlier of 332,000 in February, over half the total. The ISM Manufacturing Index measured 50.7 in April, up very slightly from the 50.2 at yearend. 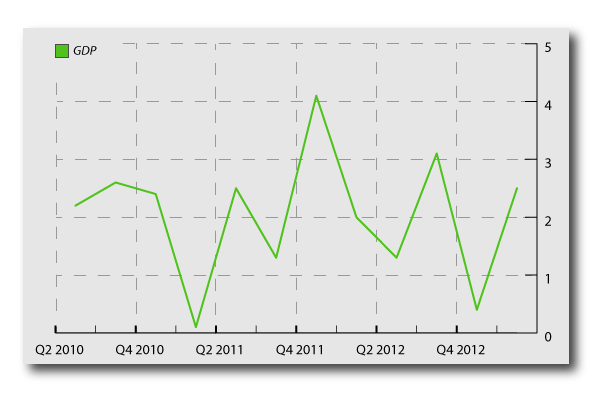 The four-quarter average GDP growth rate was 1.85% as of Q1 2013, down from the 2.6% at the end of Q3 2012. Much of the emerging market economic activity data is below expansion levels, and indices in many countries are down for the year. At the same time the U.S. broad market averages are up nearly 24% from the low in November. Simply stated, the last six months appear somewhat out of step with fundamentals. Many economists forecast that 2013 would be back-loaded. However, I am concerned that it might be front-loaded. As we have discussed previously, we have gone from uncertainty to visible risk; as a result, investment dollars have flowed into U.S. equities. To be sure, some of the visible risk is uncomfortable and even unpalatable at times, but financial destruction appears to be off the table. Accommodative global central bank activity has gone a long way to alleviate many of those structural concerns for now, while also making financial risk assets look more attractive. Recent outlooks from Fed Chairman Bernanke and members of the FOMC have varied in terms of continued duration and level of QE, but the Fed has nonetheless provided investors transparency into their views, and thus the ability to make calculations to the risk of exiting QE. Hopefully, we’re just in for some garden-variety economic hiccups that can be managed with only a little indigestion for investors. However, if the data softens from here, and things get really distasteful or start to look queasy, we’ll get more defensive. And, if the Fed alters course and the loose negative-rate environment changes, we will also adjust fixed-income holdings accordingly. For now, as always, we’ve got a close eye on the economy to see how things are shaping up. For more insight into Astor’s philosophy, my latest publication, the 2013 edition of “Finding the Bull Inside the Bear” is available. To request a free copy, please email info@astorllc.com.